This latest recall is very scary! Please take note and tell your friends/family! 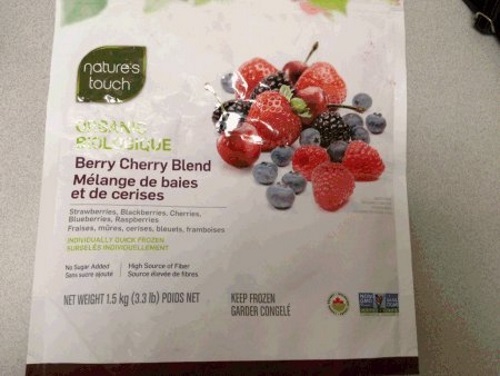 The Canadian Food Inspection Agency has recalled Nature's Touch Organic Berry Cherry blend due to possible Hepatitis A contamination! This product is sold exclusively at Costco warehouses in Ontario, Quebec, New Brunswick, Nova Scotia, Newfoundland and Labrador. Check to see if you have recalled products in your home. Recalled products should be thrown out or returned to the store where they were purchased. Consumers should not consume the recalled product described below. "Food contaminated with Hepatitis A virus may not look or smell spoiled. Consumption of food contaminated with this virus may cause hepatitis and produce a self-limited disease that does not result in chronic infection or chronic liver disease. The illness is usually mild and starts about 15 to 50 days after the contaminated food is eaten. It generally goes away by itself in a week or two, although it can last up to 6 months in some people. It can cause inflammation of the liver, and symptoms may include fever, low appetite, nausea, vomiting, diarrhea, muscle aches, and yellowing in the whites of the eyes and the skin (jaundice)." Update Apr 19 - Costco is offering Free Hepatitis A vaccines to those who may have been affected by this recall. More info here. The Hepatitis A vaccine is effective up to two weeks after exposure.